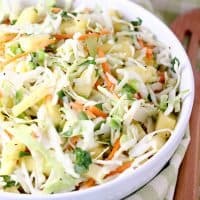 PINEAPPLE COLESLAW — Shredded cabbage and pineapple tidbits come together in a sweet and tangy dressing in this unique take on a classic salad! I’m a big fan of coleslaw in pretty much any form. My husband and kids, not so much. Although I think I’m winning him over, and this Pineapple Coleslaw is one of his favorites. This tasty coleslaw is a great side dish for all kinds of barbecue, and makes a fabulous topping for pulled pork tacos or shredded meat sandwiches. 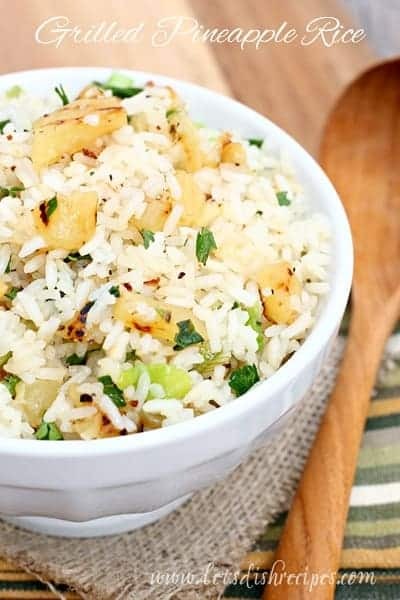 It’s the perfect balance of sweet and tangy, and I just love the chunks of pineapple–they’re my favorite part, and what makes this coleslaw so unique. Obviously my husband loves the pineapple too, because he won’t touch regular coleslaw with a ten foot pole. Even my kids like this coleslaw, and that’s really saying something! The dressing is made from ingredients you probably have on hand, like plain yogurt, vinegar and brown sugar. It’s the perfect accompaniment to the cabbage and pineapple. Feel free to adjust the amount of vinegar and brown sugar to suit your tastes. 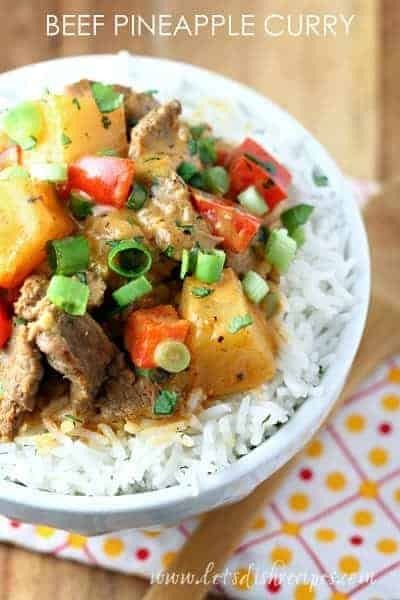 Just don’t forget to reserve some pineapple juice to add to the dressing too! Seriously, I always drain my pineapple and forget to save the juice! I also like to keep things simple by buying prepared shredded cabbage, but you are certainly welcome to shred your own. Same goes for teh carrots. You an also use a combination of red and purple cabbage. 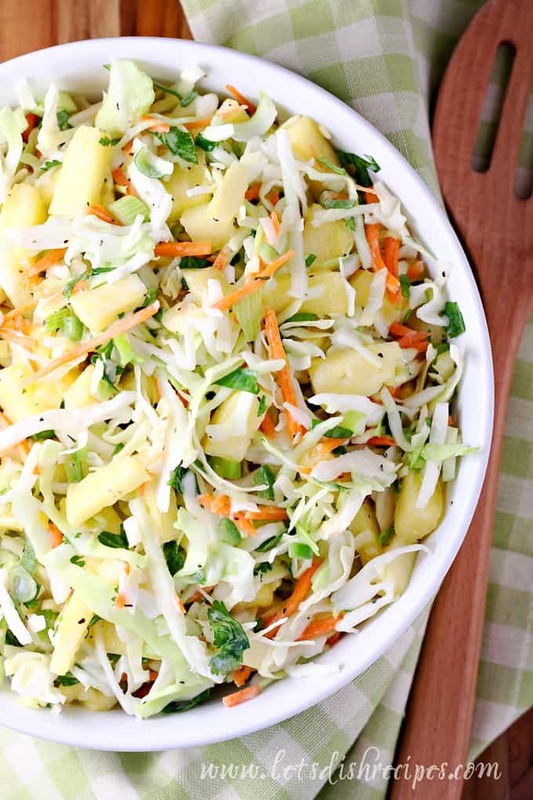 Either way, this Pineapple Coleslaw is always a hit! If you’re looking for something different than plain old coleslaw, this recipe is a must try! 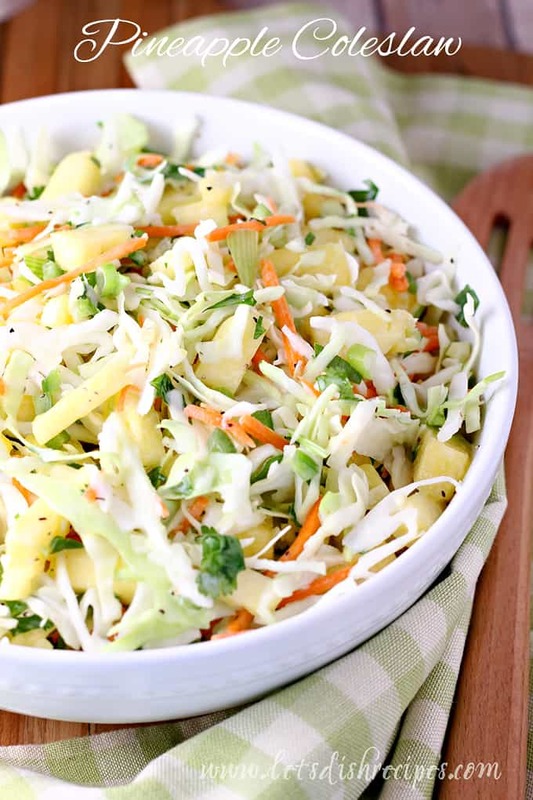 Be sure to save this Pineapple Coleslaw recipe to your favorite Pinterest board for later. In a medium bowl, whisk together yogurt, vinegar, pineapple juice, brown sugar, salt and pepper. Add the cabbage, green onions, cilantro, pineapple and jalapeno. Toss to coat well and serve immediately. Hi Danelle! 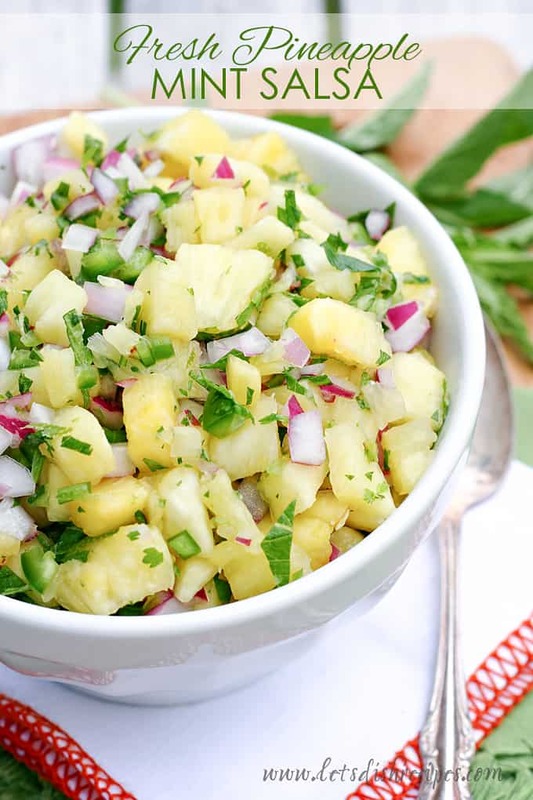 I like pineapple in cole slaw, and your slaw dressing sounds delicious! ya forgot to mention the carrots. Great recipe, thank you.